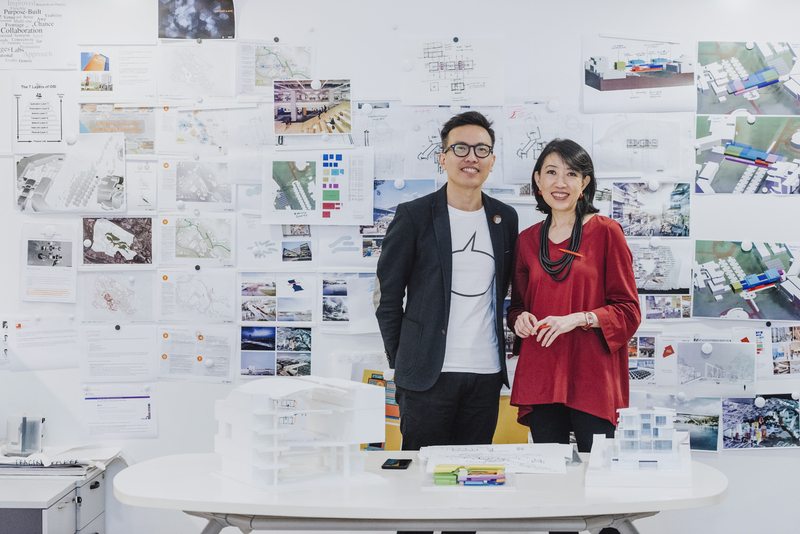 Identified in the third edition of the Urban Revelopment Authority (URA)’s ‘20 under 45’ series, Director Seah Chee Huang and Chief Executive Officer Angelene Chan (from the series’ second edition in 2010) from DP Architects (DPA) share their experience practicing in Singapore and what architecture means to them. DP Architects is known for works such as the iconic Esplanade-Theatres on the Bay and Singapore Sports Hub and the more community-driven ones such as Goodlife! Makan and Our Tampines Hub. The practice has grown from a single office with just 15 people to 17 offices around the world with 1,300 people. Angelene: By the time I was 10, I knew I wanted to be an architect. I used to enjoy watching my uncle, a draftsman, draw with Rotring ink-pens, using t-ruler and various fascinating drawing tools. I found myself intrigued by the power of the line, how the line can represent walls, spaces, with everyone understanding what the line represents. At age 12, I was very fortunate that my parents entrusted the renovation of their house to me. They gave me the freedom to follow my creative curiosity, and that sparked my passion for architecture. Chee Huang: My first and most vivid encounter with architecture dates back to my childhood days growing up with my grandparents in the HDB estates of Kallang Bahru during the late 1970s. The vivid imageries of the brutal modernist slab blocks; the seemingly endless corridor where households met; the weekend mahjong games among neighbours at the shared foyer area; the void decks were sites of fun and games; racing across the huge grass fields and catching fishes at the surrounding monsoon drains. The power of social memories of public housing architecture, and its associated ideologies of community and shared domains contributed to the development of my own sense and sensibility, as well as a keen interest towards the social impact of architecture. Tell us one project of yours you’re most proud of. Chee Huang: It is a tough choice, they are all special in their own ways. 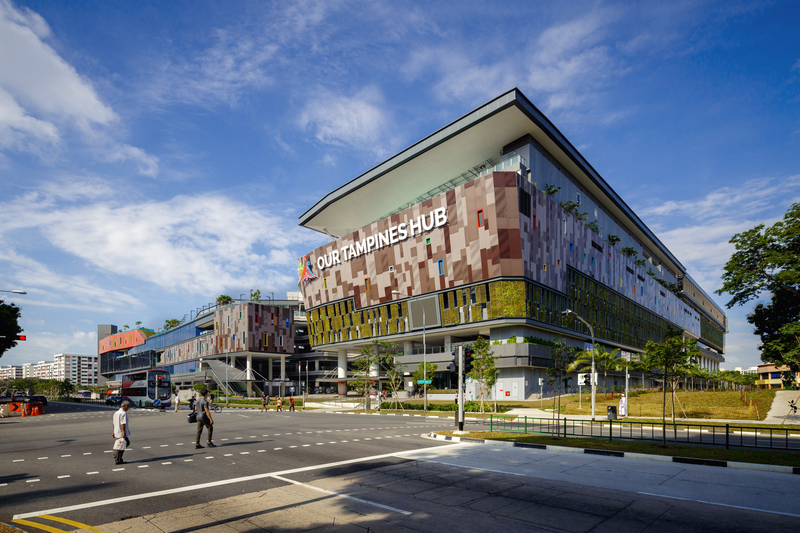 One that is particularly memorable is Our Tampines Hub. It is something truly special. Besides being a pioneering model of how the public sector can integrate their services, architecturally, it allows us to explore how our design can break down silos and bring together 12 public service agencies to work as one integrated whole. That was a huge challenge, but was extremely meaningful and satisfying. Through this people-centric project, it has given me critical insights into the dynamics that shape our social landscapes. There were a lot of resident engagement exercises and we got to meet the people whom we are designing for. Co-creating an architecture with and for the people shows us the power of our work, as architects to bring people together, and how we can empower users to be stewards of their own environment and surroundings. Angelene: Wisma Atria. It’s unusual in the life of an architect to redo a project twice. 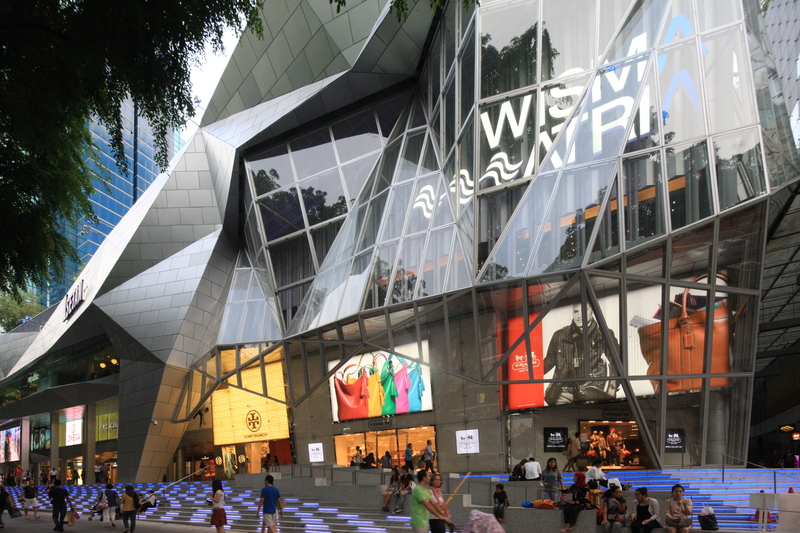 I got to do this for Wisma Atria, in 2004 and 2012. It’s emotionally wrenching to almost destroy the building even though I am thankful I was the one to re-design it. It’s also tough because sometimes your ideas are rooted in the original form. The client insisted the facade must look completely different; so you have to throw away all past notions and start from scratch. Now that it’s done, I’m happy with both results. What is one aspect of Singapore’s architecture you would like to see more or less of? Chee Huang: More sites for experimentation, particularly in the typologies of housing and schools. They have strong social and pedagogical content, and allows us as architects to contribute to the whole discourse of what are good spatial design models to shape how people meet and learn. The financial sector has introduced the concept of a regulatory sandbox so one can experiment with innovative financial products or services. This framework is less prescriptive and more performance-based. If we allow a similar initiative to take place in architectural exploration, it will open up a lot more opportunities for emerging and potentially new forms of architecture that are driven by innovation and values rather than just cost. Angelene: More greenery in our urban landscape – more gardens, parks, greenways, green lungs. Our government has done an exemplary job in greening our city; our excellent park-connector network has encouraged Singaporeans to enjoy our parks and nature sites, and take up walking and cycling as recreational activities. But for many city dwellers, the experience with nature is still an experience separate from our urban lifestyle, to be sought by way of excursions or seasonal trips. I would like to see nature more deeply intertwined with our urban streetscapes, in our usual urban haunts, so that encounters with nature become part of our daily lives, and the sense of connection and comfort that nature gives occurs as everyday moments. For instance, we have already taken greenery skywards, we can look at taking it below ground, bringing green into our subterranean spaces. What is one architectural project in Singapore we should notice more? Chee Huang: Our public housing. I grew up and spent a large part of life in a public housing estate. The cool part is seeing how our public architecture started as a highly efficient housing model and overtime, evolved to the quality housing with distinctive design like what we see today in Pinnacle @ Duxton or the projects at Dawson estate. It is more than just being houses and flats, it’s about homes. There is a strong sense of purpose, as it is really about our people. This is one part of Singapore that is truly authentic and unique as it is something that has evolved with time, and become a vital part of our social memories and identity. That is most precious. Angelene: Both of our answers are the same! It’s one of the best models of social housing in the world and I am proud of it. A lot of countries are trying to emulate what the Housing and Development Board (HDB) is doing. And HDB’s architecture is getting better, and they are so progressive in their vision. It’s not just the hardware and the architecture, it’s also the software and the community. So much of their work is taken for granted, but they should be applauded more. Chee Huang: My next project. I believe the best is yet to come. Angelene: It is one where the client allows you to explore what you want to do, and there is no constant discussions over controlling costs, efficiency, and this and that. I’ve experienced that with designing the headquarters of Sunray Woodcraft Construction. The client was very respectful of the architect’s vision, and of course, we worked within constraints of cost, time and codes. But we had the freedom to help them realise their vision. Has architecture turned out as what you expected? Angelene: Architecture has turned out to be more fulfilling than I had ever expected. When I first started out, I saw architecture as a medium to develop my interest in design and to realise my dream to sculpt spaces. I naively didn’t fully comprehend the extent of the impact that our work can have on the environment and the users of the spaces. The realisation of architecture’s lasting legacy for future generations and its role in shaping a better world, makes creating purposeful works not only a privilege and a responsibility to be taken seriously, but a deeply meaningful act that transcends an individual’s passion. Chee Huang: Architecture has definitely turned out to be more than what I expected. Beyond brick and mortar, and building construction, there is a core aspect of architecture that is emotional and almost cerebral; that connects people, touch hearts and minds. As a saying by Aristotle goes, “the more I know, the more I know I don’t know”. In the realm of architecture, there is still much to learn and discover, its myriad of possibilities and manifestations. Beyond a profession, architecture is really a calling. The journey to seek truth and beauty thus far has been humbling yet extremely fulfilling and inspiring, and I look forward to more exciting adventures and discoveries ahead. Chee Huang: …just about design of buildings. I see it as an extension of our value systems reflecting how we collectively as a society question, think and regard our built environment through the ways we inhabit, craft and consume it. Hence, as architects, we must continue to create purposeful architecture that connects and inspires communities, today and tomorrow. Angelene: …just a profession. It is a lifelong passion. It is wonderful that architects, unlike most other professions, can have a very long rewarding career to explore their ideas and interests because creativity has no age limit. This privilege is not accorded to many professions and for this I am very grateful to be doing what I do.